Technical and market analysis of gold's position. Defining the gold market and vanishing liquidity. Portfolio switching from fiat to gold. The global economic outlook is deteriorating. Government borrowing in the deficit countries will therefore escalate. US Treasury TIC data confirms foreigners have already begun to liquidate dollar assets, adding to the US Government's future funding difficulties. The next wave of monetary inflation, required to fund budget deficits and keep banks solvent, will not prevent financial assets suffering a severe bear market, because the scale of monetary dilution will be so large that the purchasing power of the dollar and other currencies will be undermined. Failing fiat currencies suggest the dollar-based financial order is coming to an end. But with few exceptions, investors own nothing but fiat-currency dependent investments. The only portfolio protection from these potential dangers is to embrace sound money - gold. The global economy is at a cross-road, with international trade stalling and undermining domestic economies. Some central banks, notably the European Central Bank, the Bank of Japan and the Bank of England were still reflating their economies by suppressing interest rates, and the ECB had only stopped quantitative easing in December. The Fed and the Peoples' Bank of China had been tightening in 2018. The PBOC quickly went into stimulation mode in November, and the Fed has put monetary tightening and interest rates on hold, pending further developments. While today's trade protectionism is less vicious than the Smoot-Hawley Tariff Act, America's drawn-out trade threats today are similarly destabilising. The top of the credit cycle in 1929 was orthodox; its principal effect had been to fuel a speculative stock market frenzy in 1927-29. That is the debt trap, and it has already sprung shut on minimal interest rates. For a temporary solution, governments can only turn to central banks to fund runaway government deficits by inflationary means. The inflation of money and credit is the central banker's cure-all for everything. Inflation is not only used to finance governments but to provide the commercial banks with the wherewithal to stimulate an economy. An acceleration of monetary inflation is therefore guaranteed by a global economic slowdown, so the purchasing power of fiat currencies will take another lurch downwards as the dilution is absorbed. That is the message we must take on board when debating physical gold, which is the only form of money free of all liabilities. Gold can only give an approximation of the loss of purchasing power in a fiat currency during a slump, because gold's own purchasing power will be rising at the same time. Between 1930 and 1933 the wholesale price index in America fell 31.6% and consumer prices by 17.8%. 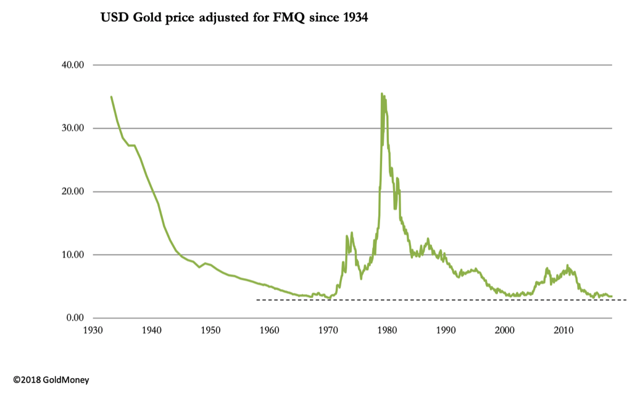 [iii] These price changes reflected the increasing purchasing power of gold, because of its fixed convertibility with the dollar at that time. In February, the gold price mounted a challenge to the upper parameter of the consolidation range before retreating to test established support at $1280-$1305, shown by the pecked lines. Chart 3 gives a longer-term perspective of gold's valuation. It is of the gold price adjusted by mine supply and for changes in the fiat money quantity. Simply put, FMQ is the sum of cash, bank deposits and savings accounts, and also bank reserves held at the Fed. It is the total amount of fiat money both in circulation and available for circulation. The realisation that the dollar faced the prospect of uncontrolled price inflation forced the Fed to raise interest rates so that the banks' prime rate exceeded 21% in December 1980. This was sufficient to prevent the gold price from further rises, and physical gold then became the collateral of choice for a developing carry trade. Central bank sales were designed to signal the demonetisation of gold and deter buyers. They leased significant quantities of bullion for the carry trade, which increased supply synthetically and drove the gold price back to the same extreme valuation lows seen in the 1960s. This was 2000-2002. After rallying from these extreme lows to a nominal high in September 2011, an increase in derivative supply coupled with the banking and investment establishment retaining an increasingly rosy view of fiat currencies have been instrumental in returning gold to the valuation lows of the 1960s and 2000 - 2002. This conclusion does no more than indicate an upper target for the price of gold adjusted for historic monetary inflation. If, as seems likely, a developing credit crisis occurs as a consequence of today's events, the quantity of fiat money in issue will rise significantly from current levels as government debt is monetised. 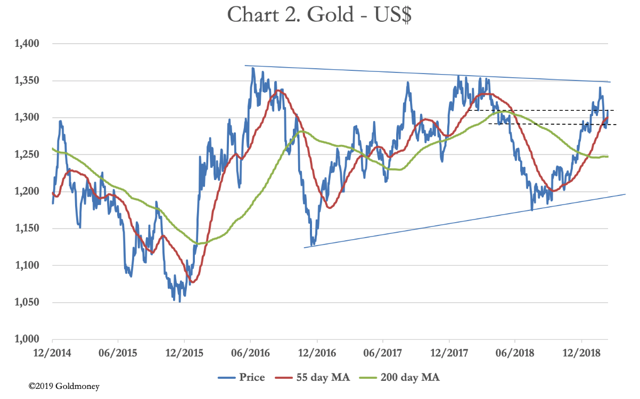 Therefore, given the extreme undervaluation of gold suggested by Chart 3, it is hard to see how the price of gold, measured in dollars, can go much lower. The gold market has three basic elements to it. There is an underlying stock of approximately 170,000 tonnes, increasing at about 3,000 tonnes a year. It is impossible to define how much of the total above-ground stock is monetary gold, not least because jewellery in Asia is bought as a store of monetary wealth and is used as collateral against loans. However, if we are to classify Asian jewellery as non-monetary gold, then monetary gold in the form of bars and coin is thought by many experts to represent between thirty and forty percent of the total. Assuming a median estimate of 35%, this is 60,000 tonnes, of which 33,760 tonnes is stated to be in national reserves. This leaves an estimated 26,240 tonnes of investment gold in public hands, worth $1.1 trillion. Much of this can be regarded as being in long-term storage. For market purposes, the physical market on its own is relatively illiquid. Secondly, there are regulated futures and options markets, the most important of which is America's Comex. Currently, there are about 520,000 Comex contracts of 100 oz each outstanding, which are worth a total of $68bn. Options on futures total a further 220,000 contracts, which are impossible to notionally value, being puts and calls at varying strike prices. If the combination of both a developing credit and trade crises leads to a modern version of the 1929-32 global economic slump, financial asset values will fall heavily. But this time, there is the additional factor of a renewed acceleration of monetary inflation, which at some point might offer some support to stock prices, at least in nominal currency terms. 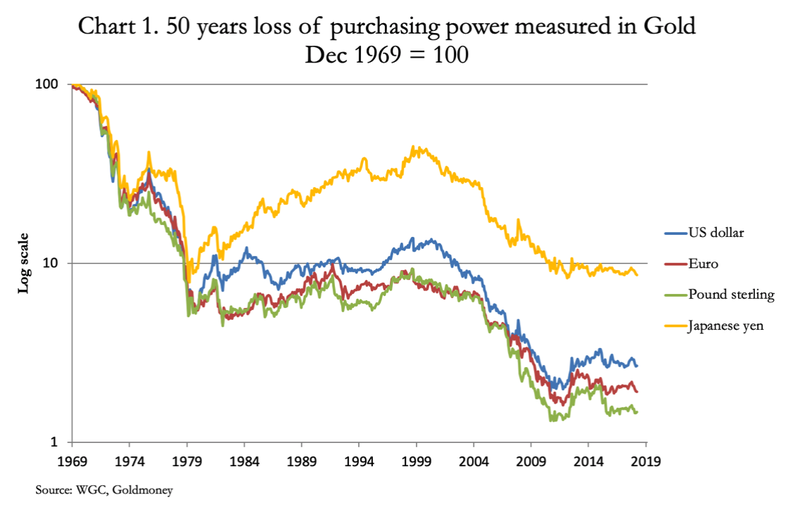 In every hyperinflation, an index of stock prices can perform well on this basis, but adjusted for the currency's loss of purchasing power, stock prices actually suffer substantial losses. That assumes, of course, the rest of the world's economy is broadly stable, which is almost certainly not going to be the case in our scenario. Additionally, the inflationary conditions of a fiat currency's twilight moments involve the market imposing increasing levels of time-preference on everything, including bond prices. Therefore, the discount between market prices and final redemption values widens dramatically. Governments and other borrowers face a near-impossible funding task, unless they are prepared to pay increasingly higher interest coupons. Unlike the experience of the great depression when interest rates reflected those of gold, this time bond yields paid in fiat currencies will rise and continue rising. 3. Foreigners liquidate US investments in order to sell dollars (the reserve currency - this appears to have started early) and repatriate funds to support their base operations. Bond dealers facing a glut of government bond issues expect bond yields to continue to rise. Stock markets slide, and with it is a growing realisation that the recession is turning into a wealth-destroying slump. 4. As the markets' demands for increased time-preference undermine all debtors' finances, investors increasingly avoid bonds and equities, abandoning hope of any recovery in financial asset prices. Hedging into gold mines and gold ETFs gathers pace, and the purchasing power of gold continues to rise measured against both fiat currencies and against the commodity and energy complex. 5. Having fallen behind the time-preference demanded by markets, central banks are reluctantly forced to raise overnight interest rates to protect the currency and bring price inflation under control. They have no choice, but this is seen as capitulation by investors. Residential mortgage costs increase sharply, driving consumers into negative equity as property prices suffer from forced selling. In countries where the home has become the middle class's principal asset, the effect on consumer spending is devastating. Governments end up bailing-out or bailing-in lenders while trying to moderate mortgage interest costs. During this process, with few exceptions financial assets will face annihilation. A further problem is failing banks are the custodians of stock entitlements, with few being directly registered in the beneficial owners' names. At best, this leads to a temporary loss of ownership. At worst, it provides the means for confiscation. This is why the return to sound money will destroy the West's financial system, driving the purchasing power of gold higher, measured against commodities, goods and services, while that of paper fiat moves towards worthlessness. The destruction of financial wealth could easily compare with 1929-32, and if it wipes out fiat currencies will be even worse.